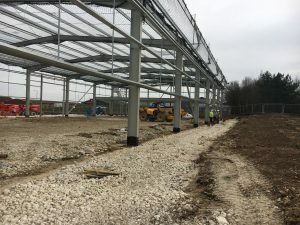 Construction of a new 12,500 sq ft builders’ merchant depot for MKM is well underway. Developers, Taylor Lindsey, are constructing the premises on a 1.5 acres site fronting the A16 at Louth, with MKM due to take possession when the building is finished in July 2018. The adjacent site has been earmarked for a new trade counter development to complement the MKM store and all enquiries are welcome.